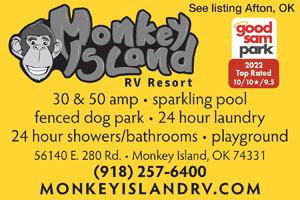 Monkey Island RV Resort is the newest luxury RV park on Monkey Island, Oklahoma located in the heart of the Grand Lake O' The Cherokees. 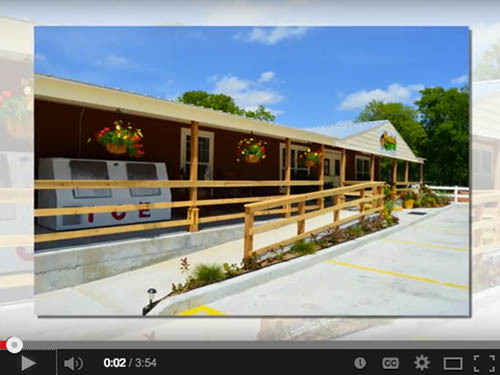 The resort features 100% concrete roads and RV pads, pool, and on-site store. Cozy cabins with big screen TV's and large showers. Excellent park and spotless facilities - including a doggy park. There are other parks in the area but they appear to be located on major roads and this park was tucked away from all the road noise and bother. Short drive to stores and restaurants and very close to a marina where you can fish or meet up with a fishing guide service. We had a wonderful stay here - AND - the staff is AWESOME!! Always caring and willing to help out - and go the extra steps to make sure the customers are happy - our site was very spacious and close to everything. We would come back in a heartbeat and will recommend this park to our friends. Stayed in a Class A Motorhome. Met members of a local club for our June Rally. Facility is wonderful. The full concrete sites/pads and club room are top notch. Pristine swimming pool is very inviting. A nice bark park also. Personnel are very friendly and willing to help. The club room was modern and updated with a full kitchen. Would definitely stay again. Only situation, after mowing, please make sure when you move the dump hose, make sure they are at a slope and not on the ground in places causing dips in the hose. In addition, blow off cut grass so it is not tracked into rigs or vehicles. I know he is young, and will learn in time. Overall, a great stay. Very nice park. Easy access and mostly level concrete pads. The road getting it could use a lot of work but that's not the parks issue. Nice pool and clubhouse, dvd/game checkout... 2 complaints which I brought to management attention after our 1st night: 1) when I went to dump waste tanks on pad C10 the ground sewer pipe was huge - nowhere near standard RV fitting and the campground did not/would not provide a reducer (easily bought at a hardware store and they admitted already knowing this issue). Every other site I looked at had a standard pipe. So it took 2 of us to dump tanks, 1 person holding the end down in the sewer and holding our nose. 2) WiFi is advertised, and it stinks. I was right near a repeater and could not keep a connection in a fiberglass trailer - not for netflix, not for a google search, not for a facebook chat... keeps dropping connection. Again mgmt said they would do something about it. These requests both were the 1st morning of our 3 night stay and nothing was improved during our stay. I did not ask for a $ credit as these were minor inconveniences and offset by the rest of the park quality, but for the price of a night and given what was advertised didn't work, a credit should have been offered if mgmt wasn't going to do anything about it. The park is new and very clean. The pool was almost done. Trees were just planted so there was very little shade. The sights are long but not very level. The front wheels on the coach beside us were 4" off the ground. The sight was long which was nice except the electric and water was at the rear of the sight and the sewer was at the front. Had to use extensions for both. The staff was fantastic. The hostess was a lot of fun to talk to. We had a bad storm coming and the staff went to every RV and gave warning and instructions if it hit us. Really awesome. We will definitely go back. Excellent park, personnel are polite, friendly and go above and beyond what you expect at campgrounds, they meet all your needs and help out when emergencies occur. This is a great park. Concrete roads and pads. Pads were level with a concrete patio and picnic tables at each. Nice laundry, showers, club house and store. Good wifi. We stayed there a week and found the park to be a great location for everything in the area. It is only about a 10 minute drive into Grove and located near several state parks on the lake. I have to highly recommend this park if you are going to be in the Afton/Grove area. Great new park with tons of fun things to do, unbelievable golf courses and fishing (great guide)!!! Steps away from the marina. Beautiful Swimming pool will be done by April and I will definetly be back to stay!!! The cabins are new and well equipped and very spacious!! We will be back for Memorial weekend with our friends who fell in love with the spots for coaches/rvs! 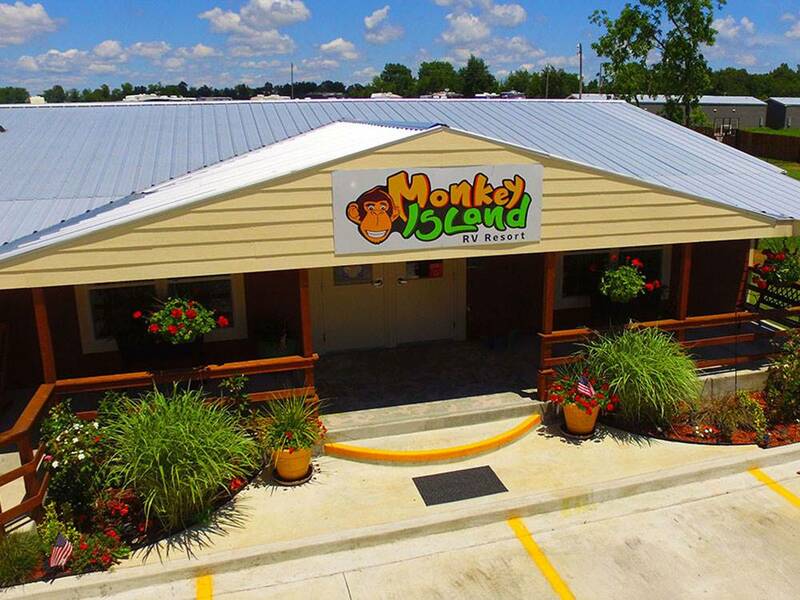 The manager was very accommodating and we look forward to our return to this new little secret that will get out fast!! In the heart of the Grand Lake O' the Cherokees! Pack your bag & come play! Enjoy the lake attractions, casino & nightlife. Relax in our pool, cook out on our grills & relax in your cabin with a big screen TV, kitchen, large shower & comfy Queen size bed. See you soon!